HVAC systems are one of the most important pieces of our homes. They keep us warm in the winter, cool in the summer, and have a big impact on the overall health of our houses. With that said, unless you’re an HVAC professional yourself, there’s likely a lot of things you might not know. We’ve gathered five of the most common questions we get about HVAC systems, along with the answers, so you can make an informed decision that keeps your system working well. Need HVAC service or repair in Titusville? Call Altman’s Cooling & Heating today to schedule your appointment! -How can I improve my HVAC system’s efficiency? There are many different ways you can make your HVAC system operate more efficiently. The most important piece of HVAC upkeep that affects efficiency is cleaning and replacing air filters regularly. When air filters get clogged up, it makes it more difficult for your system to operate. This causes extra strain on the system that can reduce its overall expected lifespan — while also making your energy bills skyrocket. You can also help improve efficiency by utilizing your home’s passive heating and cooling potential. Signing up for a maintenance plan like the plan from Altman’s Cooling and Heating will ensure your system works well year-round. -How often should air filters be replaced? This can vary depending on how much use your HVAC system gets, the size of your home, and the type of air filter you are using. A good rule to follow is to check the air filter once a month and clean or replace as necessary. Unless it is a type of filter designed for extended use, they should be replaced every three months, so check the manufacturer recommendations for best effect. -How much does it cost to replace an HVAC system? Unfortunately, HVAC systems aren’t “one size fits all.” There are many different factors that change how much an HVAC system will cost for your home, such as how big your home is, how many rooms there are, and other unique characteristics. An HVAC professional will be able to give you a clearer estimate of how much a replacement unit will cost for you when they perform an inspection. -How often should an HVAC system be serviced? While some recommend HVAC service once a year, we believe you get more out of scheduling two inspections a year. Having your system inspected in spring and fall, right before the seasons change and the system starts being used more often, will ensure any problems are caught and repaired as early as possible. 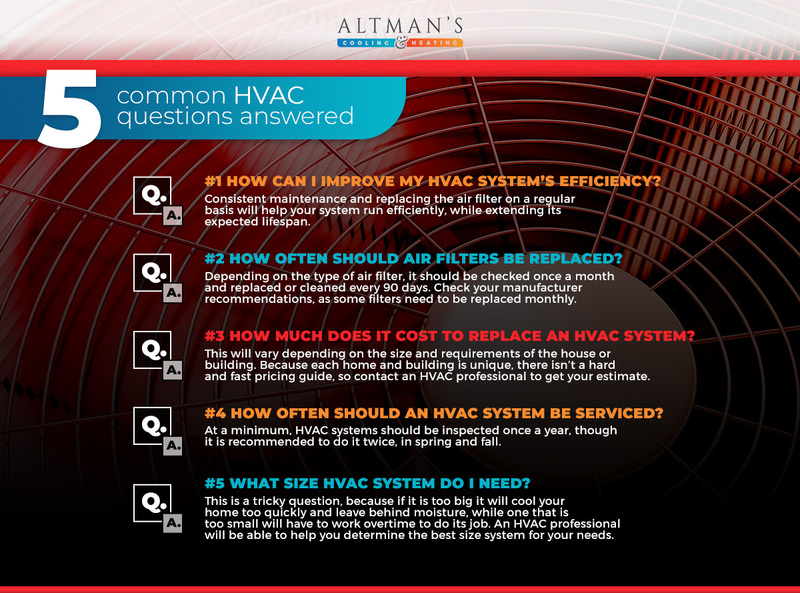 -What size HVAC system do I need? Just like there isn’t a solid way to guess how much a replacement HVAC system will cost, the size of the system you need can be a bit more complicated. If you get a system that is too big for your space, it will cause issues with moisture and mold growth, along with excessive energy usage. With that said, a system that is too small will struggle to operate effectively. An HVAC professional will be able to help you determine the best system for your space. For all of your HVAC service and repair needs in Titusville, call Altman’s Cooling and Heating. We’ll be happy to answer any questions you have!